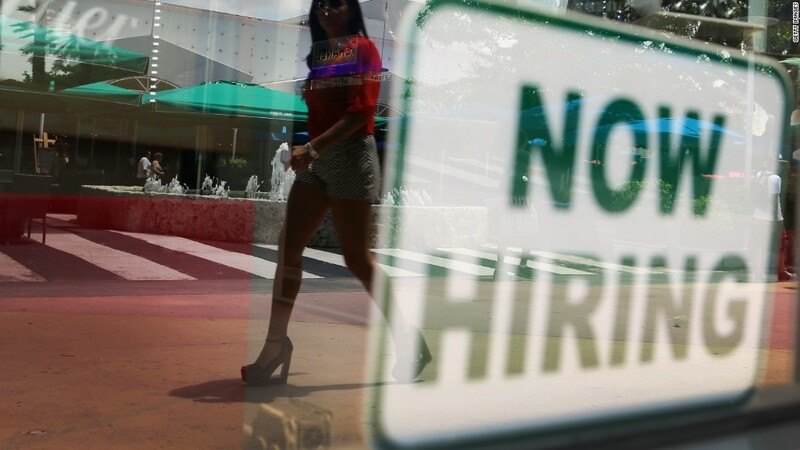 Employers added only 156,000 jobs in August as the pace of hiring slowed, according to the Labor Department report Friday. The unemployment rate crept up to 4.4% from the 16-year low of 4.3% reached last month, as fewer adults reported that they had a job during the month. The Labor Department also revised down earlier estimates for job growth in both June and July by a total of 41,000 jobs, suggesting that the labor market is not quite as strong as it appeared to be a month ago. While Hurricane Harvey has shut down much of business in the Houston metropolitan area in the last week, the storm had no impact on this jobs reading, the Labor Department said. The department collected most of the numbers behind the August report before the storm hit Texas. Harvey's impact could show up in the September jobs report if many businesses in the region are still closed two weeks from now, when they collect this month's data. The storm could also give a lift to employment when cleanup and reconstruction begins. The report was something of a disappointment, as investors and economists had been looking for job growth in the 180,000 to 190,000 range. Before this report, the pace of hiring had averaged 184,000 a month this year. Still, the report shows job growth spread across most of the economy, with nearly two-thirds of industry sectors adding jobs during the month. Among the winners were construction, which added 28,000 jobs, health care, which added 20,200 jobs, and auto plants, which added 13,700 jobs. Among the losers were federal, state and local governments, which trimmed a total of 9,000 jobs. Despite the slight increase the unemployment rate is not bad -- it's at a level considered to be at or near full employment by many economists. The last time it was at 4.4% was 10 years ago, right before the start of the Great Recession. In fact one reason that employers are probably not hiring more is because they are having difficulty finding the workers they want. Data from a separate Labor Department report shows there were a record 6.2 million unfilled job openings in June, its most recent reading. Openings have been tracked since 2000. But among the signs of weakness in the report was a continued sluggishness in wages. The average hourly wage crept up only a few pennies to $26.39, but a drop in the length of the average work week means the average worker's weekly paycheck actually got slightly smaller.